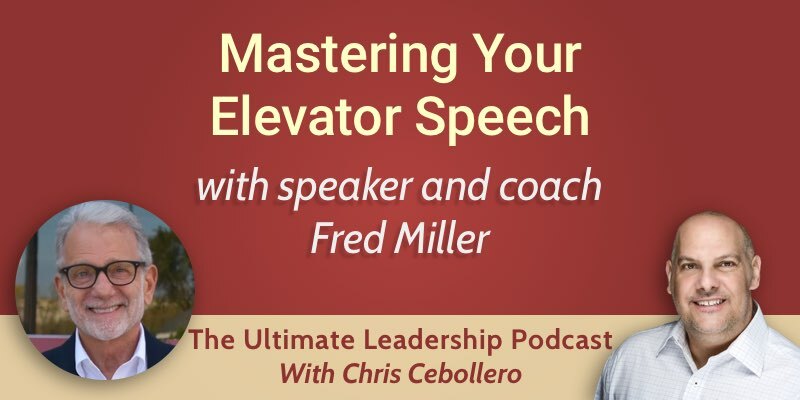 On this episode of The Ultimate Leadership Podcast, speaker and coach Fred Miller shares his nuggets of wisdom on how to deliver the most effective elevator speech to take your business to the next level. There is a difference between the elevator speech and the elevator pitch. The elevator pitch is about pitching your product or your service. The elevator speech is giving an infomercial of yourself. The DNA of Fred’s elevator speech is: “Speaking opportunities are leadership, career and business opportunities”. When you discover your why and make that the DNA of your elevator speech, it changes everything. In a group, the goal of the elevator speech is wanting people to know exactly what you do. Clarity is not optional. For a one-on-one elevator speech, you want to disqualify the people you are interacting with. Not everyone is a prospect for what you do and your time is limited. An elevator speech is a speaking opportunity that can boost your career. If you don’t develop and practice one, you are losing opportunities. An important phrase to use is: “Businesses hire me because…” You shouldn’t say “I work with…, I help them with…” “Because” is an influencer word. If you are not comfortable with the phrase “They hire me”, don’t use it, because it will come across that you are not comfortable. You can say “They become my clients” instead. A friend of Fred who works in real estate uses the phrase “People choose me”. If you have a hard to pronounce last name, you should introduce yourself using only your first name. You shouldn’t use buzzwords or acronyms. Clarity is very important. People should have different elevator speeches for different audiences. You have to deliver your elevator speech in a conversational manner. You have to practice, practice, practice. You should record yourself using audio and video. Then watch it again with the sound off. Check your body language. The second time, just listen to yourself. The third time, watch and listen. The fourth time, have someone next to you. Chris is the consummate how and interviewer! It is a privilege to be included in his exceptional Ultimate Leadership podcast.